The pump takes centre stage in the village. Old photographs of the village clearly indicate the presence of the pump at the turn of the century. At first it was used for domestic purposes – the water drawn from it in buckets and cans and there would no doubt have been a drinking trough for horses present. It was probably around the village pump that Charles Stewart Parnell made a speech when he came to the village fighting the Carlow By-Election of 1891. 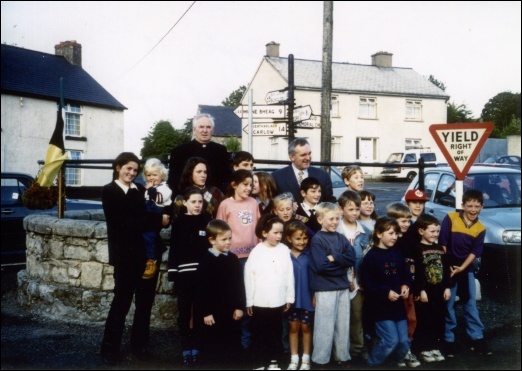 Over 100 years alter it again saw a political visitor in 1996 when Bertie Ahern, Taoiseach visited the village on a pre-election campaign. Each year the pump has a prominent position at Christmas time when the outdoor illuminated Christmas Crib is erected in front of it. A popular landmark and meeting place for young and old, the village pump marks the convergence of roads from Carlow, Borris, Tullow and Bunclody. 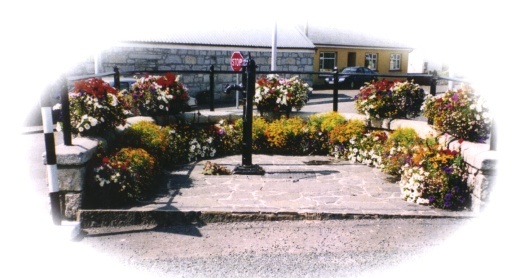 The pump has been a popular focal point for major celebrations in the village, for example; Danoli celebrations, the 1798 commemorations and the Millennium celebrations, to name but a few.